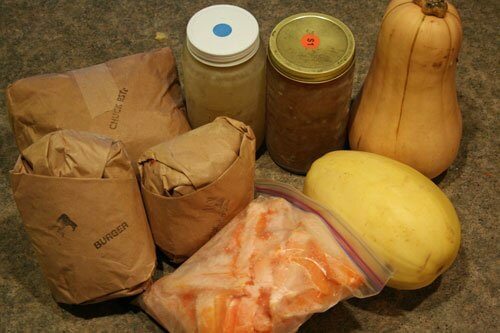 Bone broth, meat and squash. The foods we seem to live on in the early stages of GAPS! Yes, I agree. It really is intense. And work intensive. But thankfully, still entirely possible! I’m sure it helps that we’ve done umpteen special diets since I first became interested in nutrition about 7 or 8 years ago. Raw diets, vegetarian diets, the Maker’s Diet, the Nourishing Traditions/Weston Price diet (our usual diet, which I often write about), gluten and dairy free diets… we’ve done it all. Still, the GAPS diet was daunting even for me when I first began learning about it. I firmly believed that is was an excellent diet with significant benefits, and also that it would benefit our family in particular. Even so, it still took me a month or two of studying it to warm up to the idea of doing it. We did it for two months last spring and were thrilled with the results. We stopped (a bit sadly) because we were preparing to move, trying to publish my book and launch a new website, and it was all just too much for me. I then took another 7 months off of it, as I dealt with an overloaded schedule, which led to burnout, depression and fatigue. Now, after many months of desiring to get back onto the GAPS diet, we’ve made the leap and started up again. This time, however, I was much more prepared to do it than I was the first time. I remembered the initial days of hunger and frustration on the Intro diet. I remembered all of the kitchen work and food prep required. I remembered the bizarre shopping carts full of squash, apples and the like. For the two weeks leading up to our GAPS start date, I’ve been slowly but steadily making preparations that have already made our re-introduction far smoother than last time. Stock your freezer with bone broth. I spent a day making 3 huge stock pots of beef bone broth (yes, 3!) and then the next day when it was cool, removed the beef tallow and stored all the broth in glass mason jars in my freezer. A few days later, I made a whole bunch of chicken broth and did the same. I think I made about 30 quarts of broth. You might think that’s excessive, but for a family of 5 on GAPS, it’s not at all. Stock up on squash, then cook it or peel and chop, then freeze it. At the market earlier this month, I picked up 3 large buttercup squash, 4 butternut squash, and 4 spaghetti squash (the cashier looked at me and said, “wow, you must really like squash!”). With the buttercup squash, I baked it in the oven, and when it was cool I scooped out all the soft flesh into a bowl, then divided it up into bags of about 1 cup each. This is perfect for making meatballs, squash “pancakes”, adding to soup, etc. With the butternut squash, I peeled it all and then chopped it into french fry shaped pieces. These I froze in large ziploc bags, and they will make lunches and dinners so much easier with our beloved squash fries. The spaghetti squash we like to eat with a tomato and meat sauce. Fill your freezer with grass-fed meats and poultry. At the end of December, I got a new partial side of grass-fed beef. I still had just a couple whole chickens left in the freezer, as well as extra carcasses for broth. Then I went and spent almost $100 on nitrate-free, grass-fed sausages, bacon, etc. Now I just need to go pick up some extra fish. To stay full on GAPS, you will need to eat a lot of meat and fish, probably some at almost every meal. Pre-cook that meat and freeze it in meal-sized packages. I did a delicious (huge) roast in the crockpot, and froze all of the leftovers into bags of about 1 or 1 1/2 cups of chopped meat. I pre-cooked 4 lbs of ground beef and froze them in the same size amounts. I pre-cooked a whole chicken and froze 4 bags of chopped chicken. Tomorrow I’m making squash meatballs to freeze as well. One of the first foods that we start eating on the diet (after the initial soups) is cooked apples. I fry them in a pan with no oil, and just a few tablespoons of water, with a lid over them. They take about 3-6 minutes to soften nicely. I sprinkle just a touch of cinnamon on them towards the end. They’re our favorite treat in the beginning when we can eat nothing else, and they’re nice for breakfast with eggs. I make the prep much easier by peeling and slicing a lot of apples for the freezer all at once. 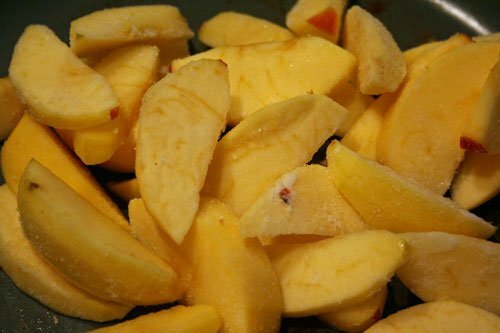 These can also be quickly cooked into applesauce, if desired. Blow all your money at the produce market. This isn’t quite true, but almost. I usually spend $35 every two weeks on the bulk of our produce. This last time, I spent $100. Granted, that included a big box 20 lb box of apples, 25 lbs of organic carrots, and all those squash (and, I didn’t spend much on so many of the usual foods that we eat). I also purchased a mammoth supply of Intro-friendly vegetables to add to soups and stews, like zucchini, onions, leeks, celeriac or celery root (again, a nice celery substitute), turnips, parsnips, cucumber, beets, cauliflower, etc. Make soups for the freezer. If you have the time to do this at all, it’s a great idea. Making soup from scratch can take a while, when you need to chop everything up and let it simmer. Make a batch or two in advance so that you have some you can simply thaw for busy days or when you’re running low on time. Shortly before we began, I made a large pot of Hamburger Soup (a new recipe I came up with that the entire family loved, to be posted soon!) and it helped to make those early (read: hungry) days easier. Soak and dehydrate nuts and seeds. This isn’t very time consuming, but it does take several days to do it. One day to soak them, another to dehydrate them. Doing it in advance, when you have a few extra moments in the kitchen will save stress later on. 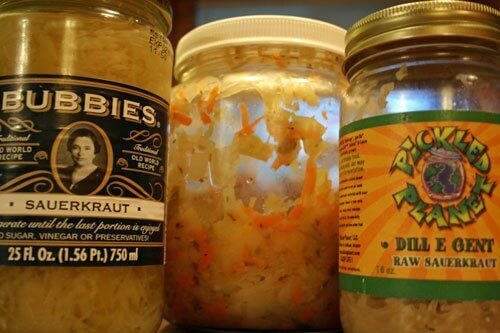 Make or buy fermented foods like sauerkraut. One of the hardest things about restrictive diets is the frequent hunger that strikes early on, and those desperate feelings of searching through the fridge and cupboards thinking “There’s nothing I can eat!”. 1. Find recipes that look appealing, or ones from my current stash that will work or could be altered. Grab a scrap piece of paper and write down every possible meal idea or recipe you can come up with (seriously, everything). Scour some websites or blogs for ideas (a few favorites with GAPS friendly recipes include Nourishing Days, Health, Home and Happiness, Pecan Bread and GAPS Guide, and see this post with some of my own ideas and recipes we used). 2. Plan out at least one week (two is even better) with all breakfasts, lunches and dinners, and even snacks. I don’t always plan breakfasts and lunches when we’re eating our usual diet (I go back and forth, sometimes I do, sometimes I don’t). But, when we’re embarking on any sort of special diet, I make a point of doing it, at least until the diet begins to feel more natural. Don’t be afraid of re-using some of the same meal ideas multiple times. It’s pretty normal when your choices are limited. Try to come up with creative ideas for eating the same foods in unique ways. Eating eggs for every breakfast? Have them fried one day, scrambled with sauerkraut the next, make a veggie omelet another day. When you know what you’re going to eat for each meal and you have many of the components of your meal already prepped, making it through the beginnings of a special diet like GAPS isn’t really that bad at all. And even if you’re not on GAPS or any other diet, this type of food prep and meal planning always helps to make meals flow easier when you’re a busy mama! Are you on any special diets? What types of food prep help to make your meals come together easier? Hi Stephanie! Would you recommend this diet while nursing?? Thanks! @Caitlin, I am both pregnant and nursing and on GAPS. I think it is a good idea! It can heal your gut flora AND help your baby. Just be prepared to be starving all the time at first! @Caitlin, From my understanding it’s okay when you are nursing but you would skip the intro and go into the full GAPS diet. Stephanie, thanks for giving us the low down on how to get started with GAPS. I have it in mind to try, especially since our son may really benefit from it since he has Asperger’s Syndrome. However, please be careful when referring to parents of special needs kids and telling them what is possible for them. If you don’t have a sn kid, you can’t imagine the physical and emotional toll caring for them can take on you. Add in homeschooling them, and there’s very little that wouldn’t seem “too intense” for them to add to their life. @amy, I really appreciate your concern for those with special needs children and the struggle of caring for them. I do very much understand what it’s like to live with a special needs child, as I have one myself and a second who has somewhat high needs as well. I know that it is already intense in everyday daily living, let alone adding in a special diet. And for my friend and many others, this is very far from how they already eat or anything they’ve ever tried, so that definitely adds to the intensity. That said, I still want to encourage others to consider it and give them some tools and tips to make it easier. 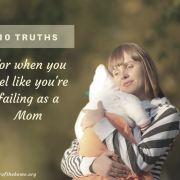 It’s still hard, and for some families it might be really, really hard at first. But I do feel sad when I know of families who would benefit so greatly from something like this and they feel that it’s out of reach. I am not even remotely trying to say “buck up and just do it”. That would be insensitive and entirely discredit the strain that they’re already experiencing. Rather, my heart is really to encourage and offer suggestions and ideas that will make it just a little bit more possible for others to do this, if it’s something they’re considering. And if they can’t do it, that’s ok, too 🙂 Thanks for the comment! Stephanie, this was a very helpful post. We are trying to get our family of 9 started on a grain-free diet, but as of yet, we have not done the full GAPS diet. I wondered if you had any tips for doing GAPS on a budget? Feeding 9 people (including 6 boys, although one of them is just nursing right now) can be a challenge, especially when it comes to working in enough grass-fed, pastured meat and poultry and high quality fish. We moved a few months ago and had to give up our laying flock and our freezer full of local meat, etc. Having to buy all this stuff at the grocery store (I have a Whole Foods w/in driving distance) is a bit of a shock! @Angela, I would definitely see if you can find any local farmers that can help to supply you with the protein portion of the diet more cheaply. If I had to buy it all at local stores, it would be really though on my budget. We get our eggs pretty cheap direct from a local farmer, so we eat a lot of those. I try to stick to cheaper and seasonal veggies to keep produce costs down. We don’t use the official Bio-Kult probiotics because of cost, but use others that are good just not quite as pricey. We got our beef in bulk from a local farmer, and our chickens from a friend who raises them. 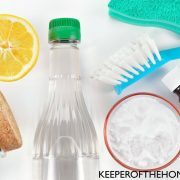 Buying everything in bulk is one of the best ways to make it work (which you would do anyways as a family of 9!). You could try to use more broth to cut back on the need to use as much meat (because of the protein sparing effect of the broth), but you’ll need to add more good fats and heartier veggies to the diet to keep yourselves full. 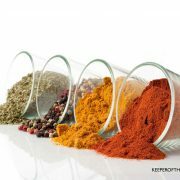 @Stephanie @ Keeper of the Home, Would you mind sharing the probiotics that you chose to use? I am finding Biokult to be a bit cost prohibitive. THANK YOU for doing this wonderful post. I knew I read it long ago and had to do a web search to find it again because it is so good and helps me “get my head in the game”. I am SO EXCITED that you are doing this series…I just purchased the book, with the recipe book, and am looking forward to this adventure. How fortunate for me that your timing is similar to mine!!!! Just after reading this I realize that I may need to do some more prep, so I think we’ll start Mid/Late Feb. I feel so much more prepared and confident knowing that I’ll have this resource! Thanks! Great blog post! We’re also doing the GAPS diet. We’re on the 4th week. I’ll be following your blog closely. Squash meatballs sound intriguing!!! I printed the recipe from the link, thanks. I do think that this kind of eating would help our family (me in particular) but I don’t think that my husband would do it at all, plus I honestly do not have any energy for thinking about anything else other than what I am already doing right now. I know that is sort of a paradox I guess…but its true. I am wondering how long you plan on doing this diet? What happens with starting and stopping? What if you can’t get totally grass fed meat? (I can get meat that is grass fed to the end and then given some grain to get “more meaty”. @Nola, I think you have to just decide based on your own capabilities. I do feel a bit tired and worn out to be doing this right now, but at least we’ve sold my other blog and I have more free time than I used to have. I’m just giving myself lots of grace as far as homeschooling, house cleaning, etc. in order to have enough energy to make our food. I sort of spend most of my time in the kitchen right now, but it’s just a season. We did it for 2 months last time, which wasn’t enough to make long-term changes. We saw positive change happening, but it didn’t stick after we went back to our regular diet, so the healing obviously wasn’t finished when we stopped. We’re aiming for more like 6 months this time, or even longer if we have to. We want to make sure that we really do it thoroughly, rather than having to do it again later. It takes time for the gut to truly heal. I think you could definitely still do it without entirely grass fed meat. Obviously it’s ideal, but it doesn’t make the diet ineffective if you can’t get it. If you just did the best you could with your meat sources, and did all the other stuff (broth, probiotics, veggies, fermented foods, etc.) I think it would still be very worthwhile and almost equally effective. It’s more about the foods you’re cutting out and the healing foods (like the broth and probiotics) rather than about the quality of the meats. It matters, but it’s not the main thing. I spent the WHOLE weekend cooking. I made salads, homemade yogurt, yogurt popsicles, jerky (we just bought a WHOLE cow! ), a couple big pots of stock, I rendered a large amount of beef tallow (maybe 25 cups? and I have that much more to go! ), made soup for my husband to take to work, and some more stuff…. There’s more on the plan for today, too. I bought the Bubbies dill pickles, some Good Belly probiotic juice (yogurt popsicles and juice-based stuff are the only probiotics my DD will take). I started some probiotic lemonade and fermented salsa. Although it’s not technically GAPS-legal (I’ve been on it for a week with no real symptoms and since I’m pregnant I need to stick to full GAPS), I made some refried beans (cooked in stock, fried in pastured lard) for snacks, which I’ll top with cheddar and fermented salsa. I also made 4 gallons of kombucha and started 4 more. I’ve discovered one of my husband’s favorite snacks is chicken and vegetables cooked in some stock. I freeze the stock in ice cube trays and I only use 4 – 6 cubes for each snack. It has not been nearly so hard this time. The kids are eating all.day.long., but they are willing to eat bits of chicken cooked in stock, soup (my son had two bowls of chicken and white bean soup last night! ), good hot dogs, yogurt popsicles or plain yogurt (my son loves it…in fact, when I’ve been making whey, I’ll give him the thickened yogurt and he LOVES that), jerky, etc. I’ll be making Cara’s coconut flour crepes and “jam” (blended fruit and honey) for snacks, and coconut milk ice cream (there’s a tutorial on making coconut milk on Nourished Kitchen). I’ve planned an official snack everyday when my husband gets home plus random snacks as the kids or I need them. It’s necessary, it is a lot of work upfront, but it’s so worth it! It does certainly get easier once you’re on the full diet, but the prep can still be fairly intensive. And our shopping sounds so similar! Now I want to go and make fermented salsa, one of our favorite things to eat with eggs. Yum. And you’re right, it’s so worth it! Hi Stephanie! I wish I’d read this a few weeks ago… we are starting GAPS as of TODAY! (I’m sure it will still be helpful though… I’m going to be a cooking and chopping madwoman this week!) Our ‘breakfast’ is simmering on the stove as I type 🙂 We are doing the Intro Diet. I’m blogging about it as we go, at http://www.redandhoney.wordpress.com. We eat most of this way a lot (but need more probiotics and less carbs – we’re currently eating rice and gluten-free pastas/breads/cereals) and love how you’ve laid out how to do large preparing in advance. My question is: I’m currently about 105 lbs…..and my family/friends worry that I will lose weight if I cut out all grains. I need to, to heal my gut…but what should I do to make sure that I don’t lose weight on this diet? My husband and son also have issue that could be healed through this (allergies/fungal infections/ADHD/aspergers). @sharon, Well, you might lose weight at first. I’m someone who has a tendency to be on the skinnier side when I’m eating well, and when I go grain-free I do lose a bit of extra weight. You’ll just want to make sure that you eat very frequently, include lots of good fats and protein amidst all the veggies, and just use common sense. If after a month or two you’re losing weight to a dangerous degree, then consider adding back in something minimal like a slice of homemade sourdough bread each day, or maybe some potatoes (sweet or regular). As long as you keep those things very minimal and still stay off everything else, the weight loss should slow down and it shouldn’t hurt your progress too much if you’ve already started the diet really strong. This is probably a silly question, but how do you peel a squash? I’ve never heard of doing that before. Do you peel it raw? Do you use a peeler like you would a carrot or potato? Thanks! @Jill, I do use a regular potato peeler, and I do it raw. It just takes a little bit more muscle than peeling a potato, but really not much more. laying the ground work for the diet and taking the necessary steps to make it work! @Karen, We will definitely be sharing more about the GAPS diet, as well as grain-free recipes ideas, in February, so look forward to it! Thank you for posting this, I’ve just started looking into the GAPS diet. Thank you for the great post! It was REALLY helpful! So- long story short- do you think our family (and esp with me being pregnant) would do best on a Weston Price-type diet, the Maker’s Diet, or GAPS? I am really wanting this pregnancy to be healthier than the last! @Jennifer, Although I think GAPS is probably useful for nearly everyone, it doesn’t sound your family particularly needs to go on it at this time. What might be a better choice is to do the Maker’s Diet, which does go through a period of about a month grain-free (sugar-free and starch-free), doing some cleansing and re-building a healthy gut flora, but it’s a bit easier to do than GAPS, and it leads you straight into a full Weston Price style diet by the 3rd stage. It’s a fantastic diet and we always feel so good when we do it! I often eat a lot of very healthy recipes I have from the raw vegan diet (although I do eat meat, just not often, so I am NOT vegan, but like to use the recipes) but find it hard to be consistent with a growing family. 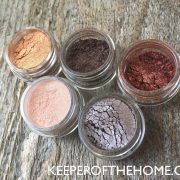 Your post has a lot of good pointers on how to stay on track…thanks! Hey STephanie we’re going to try the gaps diet so I’m trying to get things figured out. When you do the intro diet do you eat soup for every meal..including breakfast? I guess I’m kind of confused as far as what’s allowed for the intro diet. Any suggestions? Thanks. @Stephanie, It’s recommended to start for several days eating only soup. Personally, we don’t do it for every meal because my family finds that very difficult. My kids aren’t huge soup lovers and they begin to revolt, and we all get incredibly hungry. We’ve done soup only for the first day, then we add in just a few other foods (like eggs, cooked apples, meat and veggies) and we continue to drink broth with every meal we eat that isn’t soup. Ok. Thank you so much! That really helps. Our oldest daughter has been following the GAPS diet, and she is feeling better, and looking better. I am now considering it myself because I just got out of the hospital after 7 days with a serious intestinal infection. I have also shared your blog site with my friend who has had surgery because of intestinal problems that even required surgery. Hi Stephanie – I just love your blog! I’m going gluten free – this is my 2nd week – and I have to agree with you 100% that it’s all about preparation. I’m such a convenience eater, and if I don’t have those snacks ready and handy, I will fall off the bandwagon in a heartbeat. Cuz when I’m hungry, I’m cranky, and I’m going to eat! We’ve been on GAPS for almost a year now. We’ve cut out honey, fruit, sweet veggies and nuts. We are now doing basically a candida diet which Dr NCM says all GAPSTERS must do at some point during the GAPS diet. TThe GAPS diet is both incredible for healing, incredibly hard, frustrating and rewarding. I am so happy to hear that you are going back on the GAPS diet. I know last year when we did it for a few months, our whole family felt great. We sadly went off because of the increase in our grocery bill, but it has had a lasting impact on our health and overall diet. My old health problems have not resurfaced since doing the GAPS diet. We try our best to make one or two of our meals each day still GAPS diet friendly. This helps our whole family stay healthy and feel our best. Over the past year we have had times where we have gotten out of balance with carbs and sugar(holidays, busy times, meals away from home), but we always gladly return to more GAPS friendly meals to get back to feeling good. May God bless your GAPS journey! We are going to go grain free as a family either next week or next month (depending on the budget), so I am really looking forward to the grain free meal ideas! You forgot to mention “throw out all your junk food so you’re not tempted to break your diet”! Good luck. I’ll be following your GAPS journey. Don’t think I could ever get my husband to do it with me! My Daughter has has a “flora digestive” imbalance. Her specialist put her on Nilstat(Nystatin) and creon(Pancreatic extract), practicly no sugars or a number of staple foods she had set up reactions to. Her imbalance was a result of sensitivity to antibiotics. She ate, lamb, beef, sweet potato (yams), broc, cauli, cucumber, celery, carrot, buckwheat, quinoa, millet, almonds, filtered spring water, carob (powder), steivea (sweetener in pure form not mix like for suger replacement in coffee) All her foods were roatated eg. not the same grain or vege two days in a row. Now she enjoys a much wider (yet narrow in some peoples view) variety and is improving daily (2.4 years after initial reaction). Praise the Lord for a very clever and “think outside the box” specialist Dr. Collin Little, Melbourne Australia. This is a great post! I am getting ready to start GAPS now that we are home from our vacation. It does seem so overwhelming at first. This post is VERY helpful. We are committing to 6 months as well. I am very interested to see how we all feel. Especially my daughter who has so many issues. I also bought a DVD of the GAPS author giving a lecture about the diet. It is nice to be able to watch it and get a good idea of the why behind it all. It is also nice to share it with others rather than trying to explain it myself. My Mum watched it and is now starting the diet too. She was able to tell me that I had many of the symptoms as a child (which I didn’t know). Looking forward to hearing and sharing success stories all around! A reader on my blog referred me to yours. We too are embarking on GAPS presently. I posted about it yesterday. Here is a link if you are interested. I’ll be sure to check back and share this journey with you as we embark on our own. Would you recommend Clomid for someone who has PCOS? I’ve tried everything from herbs to a real food diet and nothing is helping me ovulate. I hate thinking I have to take a medicine to make my body work, but I’m at my wit’s end. Should I take the Clomid? Jen, I hope you’re still out there. I was shown to have PCOS last year and have since delved into finding out what I could do for it. The cysts are caused by androgens, a male hormone that is present in the female body naturally but will go into overproduction if there is an insulin imbalance. So if your blood sugar is off, you can only rely on your hormones to sort themselves out. I (and probably most women with PCOS) also have a low thyroid, and therefore my hormones are not strong enough to sort things out, so everything is kaput. Your thyroid is controlled by your pituitary gland and hypothalamus. If those are “off” or undernourished, then it trickles down into all sorts of problems. what a beautiful post, I am just starting my research for GAPS and am happy I found your blog and am happy to hear you are nursing doing it too, as I will be as well. thanks! For children with apraxia and adhd, are they recommended to stay on the diet forever or grain free forever? Thanks for a great post, we are 4 weeks into the GAPS diet, and need some help prepping so we don’t end up cooking 2.5 hours – every night! It is exhausting but I know it’s worth it. 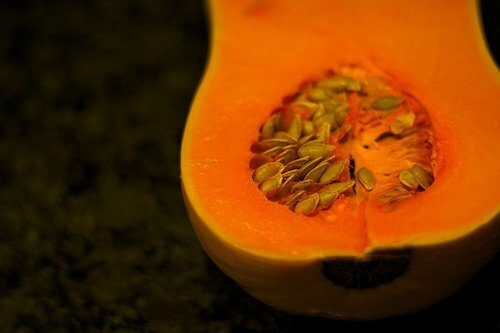 One question though: my daughter (22 months) is a very picky eater (which is typical for children with GAPS) and every day she eats butternut squash soup (I hide all sorts of good meat, fats, and protein in there to keep it slightly varied), but I am worried that the butternut squash might be too sweet, as we are also on a anti-candida diet. She eats it every day, usually for snack too. Am I to worry you think? Wow this has been so helpful. We are on the GAPS diet and I rushed to quickly through the steps, and am now going back to step 1. Thank you so much for taking the time to post on this. Have you or could you post some soup recipes? I’m glad to hear others are doing the diet, because no one that I know is! I really need to utilize the freezer as you have done! Thanks again! @Lisa, I think that you can still do the diet, but I would put off the intro for yourself until you wean. You can detox pretty heavily while you’re on the intro. Instead, do the intro for the others and include some foods from the full diet for yourself to keep your own body from reacting as strongly. You’ll still have a healing response and it will be positive, but it just might not be as fast or obvious at first. Once you’ve weaned, then you can go back and do the intro to really complete the healing process. I’ve been researching the GAPS diet for a little while now, to try with both myself and my autistic son who has gastrointestinal issues. The one thing that has prevented me from starting it yet is that a lot of the baked good recipes that are allowed on the diet use coconut flour. My son does fine with almond flour, but anything that has coconut in it causes him to start wheezing. Do you have any suggestions for a different type of flour to use as a replacement, or should I just stick to recipes that only use almond flour? @Ashley, I would stick with nut flours then if there is any noticeable reaction to the coconut. He might have a particular sensitivity to coconut, so definitely avoid and don’t try again for a while. You don’t have to do only almond (although it is very nice), but you can also do flours made with cashews, pecans, hazlenuts, etc. As long as he can handle those nuts, they should be fine. Do you have the gaps book? The website has parsnips on the do not eat list, but I see you have them on your intro soup list. I have two parsnips sitting in my crisper but I’m not sure what to do! I wasnt sure if that was something dealt with in the book. Thank you so much for all of your other helpful posts. My husband is already feeling better ten days in, I’ve lost a few pounds, and our kids who aren’t following the diet still ask for broth and soup evey day. I do want to get the book, but haven’t made the time to order it yet. I worry about to much meat and fat on this diet. How about people with Blood Type A, who should be vegeterian. My cholesterol on Atkin diet shoot to300! I am starting the GAPS diet on April 1st. I really want to make your hamburger soup, and would appreciate it very much if you could post the recipe whenever you have time. 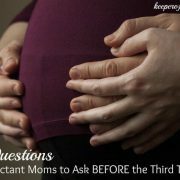 Great article and sooo helpful! I’ve tried to start the Gaps diet a few weeks back and noticed that I wasn’t really prepared – I was forever cooking, haha. So I think I might print this and re-organise the freezer. Thank you for putting this post together. I haven’t bought the book yet, I’m just gathering ideas from people that have already started it. I was vegetarian until about 6 months ago and now I only eat chicken and fish, so the idea of eating all meat and every kind is a little daunting to me. Anyway, this post is very helpful for me. It’s always so great to have an organized list laid out of things I need to do before I get back on GAPS! So THANK YOU! My husband and I attempted GAPS several months ago, rushed through the Intro (yes, I remember that hunger! ), and then got lazy and quit. I also kept getting bombarded with the Matt Stone stuff and everyone’s fears that as an adrenal exhaustion patient I wasn’t eating enough carbs. Bleh. Even though we quit GAPS, neither of us have really craved much carbs. Before GAPS we ate TONS of rice and oatmeal. But we never went back to that. Months later, still no cravings. So I’m over the “GAPS doesn’t give you enough carbs Fear.” 😉 Besides, I ate honey and drank milk/ kefir like crazy. There’s plenty of carbs in those. Anywhoo, thanks for sharing! Now I must try to knock out the prep tasks you mentioned a few days at a time so we can hop back on GAPS and do it right this time. Thank you! The great irony of GAPS Diet for my family: a GAPS Mama’s disorganized brain has to make it all happen. Much easier doing intro this time, a year later. Something’s working, here! Great tip on mass stock prep. I’m gonna do it!! 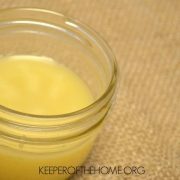 How do you store broth in glass jar in the freezer, i did that once and they broke. You need to make sure that you leave at least an inch or two of headspace, and cool them slowly and then thaw them slowly as well. I have started using plastic containers more often, because I have also had a lot of jars break. I was wondering if you had any meal plan or week meal plan suggestions for the GAPS intro? Very thankful to have come across your site! I LOVE your website! 🙂 Thanks so much! I’m a little late to the game, but you said above you freeze the pre-cut squash fries and freeze them? Do you then thaw them before baking? Any changes to the original recipe if freezing them in bulk? Thanks again!